Welcome to the Beachfront Sky Suites in Puerto Vallarta at Vallarta Shores, featuring 3 bedrooms, private pool, private chef service (included in rate) and conveniently located right on the beach. Our Sky Suites at Vallarta Shores offer a unique opportunity to enjoy stunning panoramic views and glorious sunsets of charming Puerto Vallarta – all in the comfort of seven new Sky Suites. Take the elevator to the top levels of the building, and immerse yourself in the beauty of your surroundings! The expansive, open-air living and dining space of each Sky Suite melds into the outdoor terrace and allows for uninterrupted views from every angle of the property. With a private pool just steps from the living area and daily personalized chef service (included in the rental rate), you will feel pampered in paradise. Each Sky Suite boasts three spacious air-conditioned bedrooms (3 + studio in Sky Suite E) for absolute comfort while you rest. The Master Suites offer added luxury with a Jacuzzi tub; and all bedrooms are equipped with individual safes, A/C and offer the convenience of an en-suite bathroom. Our Sky Suites at Vallarta Shores are on the south end of los muertos beach area yet remain within walking distance to restaurants, cafes and shopping. Our Sky Suites simultaneously envelope you in an aura of luxury and great comfort; although home is far away, you are sitting in your own living room. 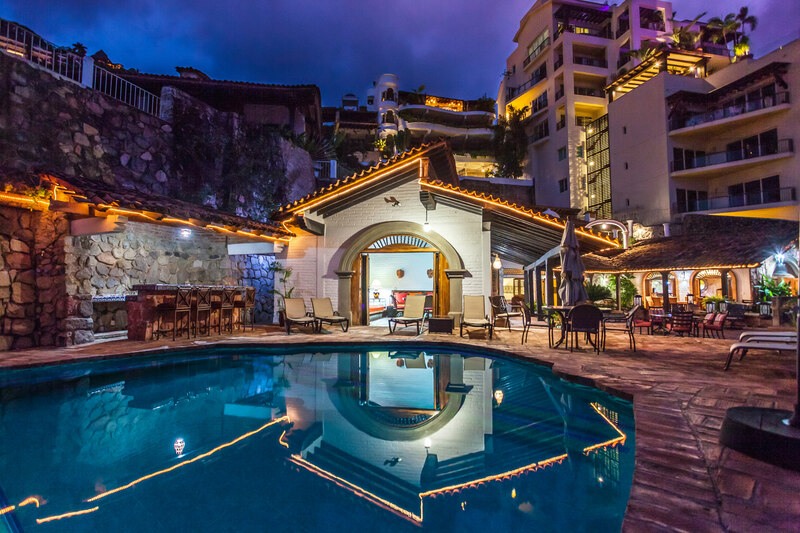 The Penthouse offers an unique opportunity to enjoy stunning panoramic views and glorious sunsets of charming Puerto Vallarta. Take the newly installed elevator to the top levels of the building, opening right into your unit and immerse yourself in the beauty of your surroundings! The expansive, open-air living and dining space of The Penthouse melds into the open air living area and allows for uninterrupted views from every angle of the property. With a private infinity pool just steps from the living area & terrace and daily personalized chef service, you will feel pampered in paradise… Read more ! With a commanding view of the entire Banderas Bay and a perfect view of Vallarta’s main beach, Los Muertos Beach..
With a spectacular view of the entire Banderas Bay and perfect view of Vallarta’s main beach: Los Muertos Beach..
From the concept to the making, this great Suite will for sure take our breath away. With full panoramic views of the entire Banderas bay and Los Muertos beach, beautiful Sky Suite C will be the..
With a spectacular view of the entire Banderas Bay and perfect view of Vallarta’s main beach: Los Muertos Beach. Welcome to Sky Suite E at Vallarta Shores, featuring 3 bedrooms + estudio/4 bathrooms on the 6th story, private infinity pool, private chef service (included in rate) and conveniently located right on the beach.. 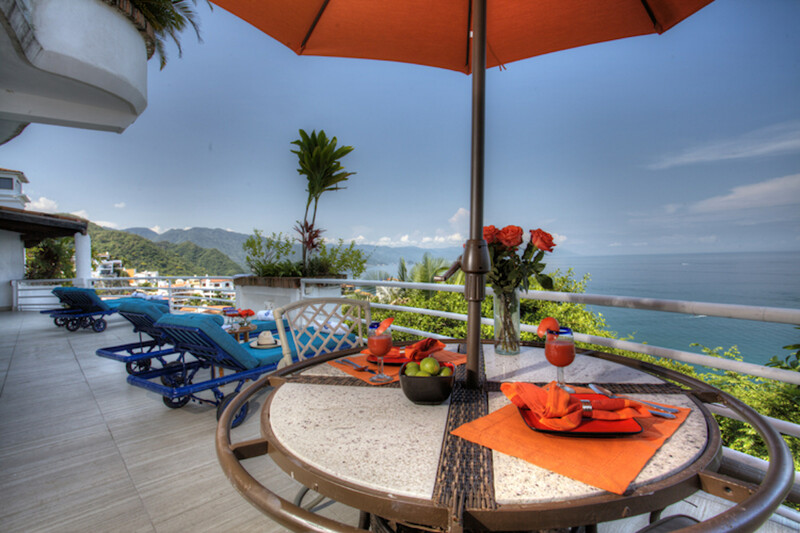 The Penthouse offers an unique opportunity to enjoy stunning panoramic views and glorious sunsets of charming Puerto Vallarta.